SANTA CLAUS, IND.—–Twenty water-filled test dummies got the ride of their lives today as they experienced the first flight of the nation’s only launched wing roller coaster. As this week’s snow thawed, Thunderbird roared to life this afternoon and launched its first train 14 stories into the cloudless sky at 2:03pm, completing a full ride circuit on its first try. Thunderbird, Holiday World’s first major steel roller coaster, features a zero-to-60 miles-per-hour launch in 3.5 seconds, followed by multiple inversions – including a 14-story Immelmann loop, Zero-g roll, barrel roll, and a loop soaring 125 feet in the air. Continuing Holiday World’s tradition of sending roller coasters through its thickly wooded and hilly terrain, Thunderbird at first soars and loops high in the air and then hugs the ground, with rapid-fire “near misses” such as a fly-through barn, stone chimneys, other rides, trees, and even the ground. 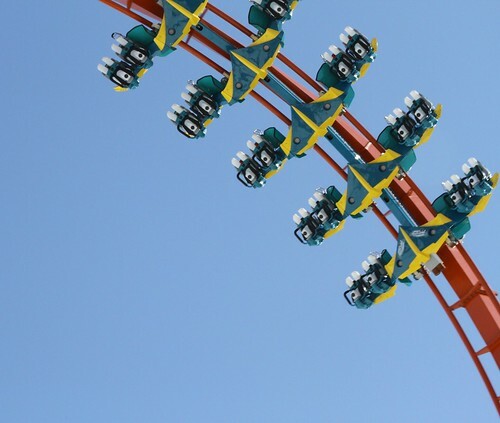 Holiday World opens for the season on April 25, with the premiere of Thunderbird. Splashin’ Safari opens May 13. For more information about the parks and seasonal job opportunities, visit HolidayWorld.com or call 1-877-463-2645. Santa Claus, Indiana — Christmas arrived early at Holiday World theme park today, as the 77th piece of bright orange steel track was lifted into place, completing the full circuit for Thunderbird, the park’s first major steel roller coaster. 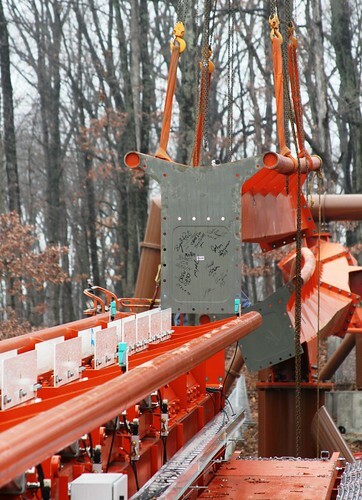 Thunderbird’s final piece of track – signed by construction team members – slides into place. Holiday World’s Vice President of Development & Maintenance, James Olliver, credits a team of more than three-dozen area construction workers for not only staying on schedule, but working through summer heat and recent snowy weather to complete Thunderbird’s more than 3,000 feet of steel track weeks ahead of schedule. Before track piece number 77 was lifted into place, Thunderbird’s construction team celebrated by signing it. Thunderbird, the nation’s first launched wing coaster, will start with a zero-to-60 miles per hour launch in 3.5 seconds, followed by multiple inversions – including a 14-story Immelmann loop, Zero-g roll, barrel roll, and loop. Continuing Holiday World’s tradition of sending roller coasters through thickly wooded and hilly terrain, Thunderbird at first soars and loops high in the air and then hugs the ground, surprising riders with rapid-fire “near misses” such as keyholes, themed elements, other rides, trees, and even the ground. Two additional ride enhancements will be announced in the coming weeks. Construction of Thunderbird’s themed support buildings will continue throughout the winter. Holiday World will open for the 2015 season on April 25. For more information about Holiday World and Thunderbird, visit HolidayWorld.com or call 1-800-467-2682. SANTA CLAUS, IND. — The nation’s first launched wing coaster hits a milestone today, as the highest piece of track is lifted into place by a 165-foot-tall crane. Thunderbird, Holiday World’s $22 million steel roller coaster, does not have a standard lift hill, but instead will launch winged trains full of riders into a 140-foot-tall loop, accelerating from zero to 60 miles per hour in just 3.5 seconds. The top piece of the loop, which weighs nearly nine tons, encloses the first of Thunderbird’s four inversions. This, the highest loop, is called an Immelmann, named for a “half-loop, half-roll” aircraft maneuver created by German pilot Max Immelmann a century ago. 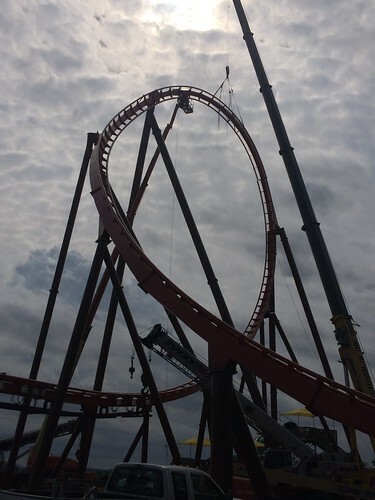 With Thunderbird’s topping, 21 of Thunderbird’s 77 track pieces are now in place. In addition to Thunderbird’s 14-story Immelmann loop, the launched wing coaster will also feature a zero-G roll, barrel roll, and a loop soaring 125 feet in the air. Holiday World’s Happy Halloween Weekends, featuring a 12-acre corn maze, park rides, and the Graveyard Smash musical show, continue through October 26. For more information about Happy Halloween Weekends and to purchase discounted tickets for $24.95 each, visit HolidayWorld.com/Halloween. SANTA CLAUS, IND—The nation’s first launched wing coaster will take flight over Holiday World in 2015. Named Thunderbird, Holiday World’s first major steel roller coaster will feature a zero-to-60 miles-per-hour launch in 3.5 seconds, followed by multiple inversions – including a 14-story Immelmann loop, Zero-g roll, barrel roll, and loop. Holiday World & Splashin’ Safari in the park’s 68-year history.